What better way to spend New Years than trying to figure out if it was really Bryant Gumbel that you heard belching during last night's Redskins/Giants game? At a couple of points during the broadcast, some miscellaneous belches were heard coming from the booth. Pro Football Talk (those guys are thorough) has the .mp3s, which you can listen to. Or you can just belch yourself for the same effect (grape soda makes this more fun). Gumbel did claim (via Mister Irrelevant) that the belching wasn't him, but rather the NFL Network "had a mike open somewhere. We heard a couple of noises that were not of our doing, shall we say." You know what? I'm not going to believe him. Not that I care, or feel like it's something that Bryant Gumbel would have any reason to be terribly embarrassed about, but you know ... if that was John Madden, no one would believe him. No one would believe Mark Schlereth, Paul Maguire, Brian Baldinger, or Bill Maas. 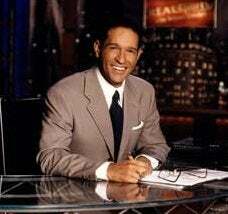 And I'm not cutting Gumbel that slack because he has a pretty voice and wears glasses. I'm going to choose to believe that Bryant Gumbel ate three bratwursts and shotgunned a PBR during one commercial break. I believe he also broadcasted the entire second half with his pants unbuttoned, and his right hand tucked in his silk drawers, that belching prick.